Instructions: To Prepare the Brownies Batter: In a medium saucepan, melt the butter and chopped chocolate over medium heat, stirring constantly, for about 5 minutes. Remove melted butter-chocolate mixture from the pan and pour into a large mixing bowl. Set aside and allow to cool for 10 minutes. Place the oven rack to the lower third position. Preheat the oven to 350°F (177°C). Line the bottom and sides of a 9-inch (22.5 cm) square baking pan with aluminum foil and set aside. Stir in the granulated sugar into the cooled chocolate-butter mixture. Crack the eggs, one at a time, whisking until smooth after each addition., then stir in vanilla extract. Gently fold in all-purpose flour, cocoa powder, espresso powder, and salt. Set aside. To Prepare the Cheesecake Batter: Add the cream cheese to a large mixing bowl. Beat at high speed with an emersion blender until smooth and creamy. Stir in the sugar, then reduce the speed to medium and beat until well combined. Whisk in the egg and vanilla extract until combined, then, using a rubber spatula or wooden spoon, fold in the white chocolate chips. Set aside. Spread half of the brownie batter into the prepared baking sheet. Top with the cheesecake batter. Layer on top the rest of brownie batter, spreading as best you can. Sprinkle the white chocolate chips on top. Bake in preheated oven for 35-40 minutes or until a toothpick inserted in the center of brownies comes out clean. Preheat the oven to 325 F (160 C). Line 8x8-inch (20x20 cm) baking sheet with aluminum foil and lightly grease with nonstick cooking spray. In a large microwave proof bowl, combine butter and chopped chocolate. Melt for about 45 minutes on high power. Stir and melt for further 25 minutes, or until chocolate is melted and smooth. Stir in granulated sugar, brown sugar, and cocoa powder. Set aside and allow to cool slightly. Stir in vanilla extract, beaten eggs, and egg yolk. Add in all-purpose flour, cornstarch, and salt. Mix until well combined, then fold in chopped walnuts. Pour the batter into the prepared baking sheet. Bake in preheated oven for 35 minutes, or until a toothpick inserted in the center of the brownie comes out clean. Turn off the oven. 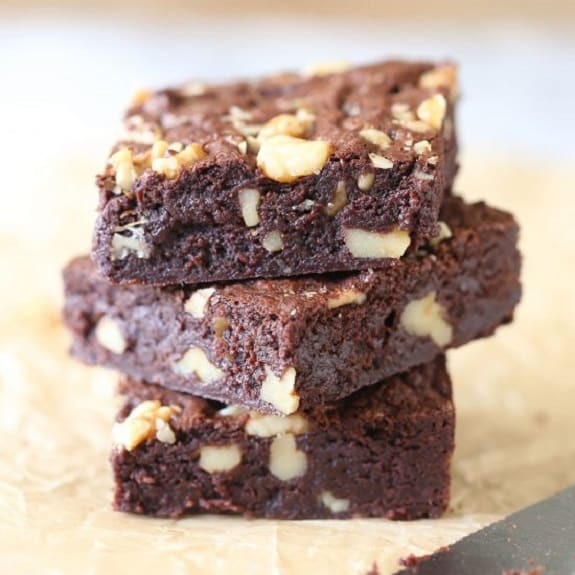 Remover baked brownies from the oven and allow to cool in the baking sheet before cutting into squares.